Given the intense competition in the current advanced amateur SLR market, Canon's decision to launch the EOS 50D six months earlier than previous models in this line comes as no major shock. The new Canon EOS 50D is apparently not intended to replace its predecessor the 40D though, and will sit alongside it as a 'sister' model. Apart from a new silver bezel on the Mode Dial, the 50D has inherited virtually the same beefy magnesium alloy body as its older sibling. There are several significant new developments under the bonnet though, chief among them a 15.1 megapixel CMOS sensor boasting a whopping 50 per cent increase in pixels. With the sensor size itself remaining unchanged, the burning question is whether this high pixel count results in increased noise. Not so say Canon, who claims that the bespoke sensor design 'allows more pixels to be ﬁtted on the CMOS sensor without compromising image quality', and offers 'improved high ISO performance and low noise'. In fact, so conﬁdent is the Japanese imaging giant that it's not only raised the maximum ISO speed to 3200, but also added expansion to 6400 and 12800 ISO via the Custom Menu. Testing for ISO noise throughout the range we were very pleasantly surprised to ﬁnd practically no noise at ISO 100 and 200; and only the slightest increase at ISO 400 – a level at which several SLRs are already struggling. ISO 800 shows a marked increase (particularly in the shadows), but the good news is it's mostly luminance noise rather than chroma noise, giving it a more ﬁlm-type grain appearance. At ISO 1600 noise in the shadow areas becomes visible at normal viewing distances, but overall the results are still impressive and very usable, which is great news if you need to handhold in low light on occasion. At ISO 3200 the noise is apparent throughout and chroma noise more significant, but it still doesn't take over. When you consider that the noise on the EOS 20D is twice as bad at each ISO setting and that much of it is the more destructive chroma noise, it's clear just how far Canon have come in this area. That said, there's always room for improvement – the two extra ISO settings are excessively noisy and best reserved for emergencies! Although we'd have liked to have seen a bit more deﬁnition in the ﬁne details of unsharpened RAW ﬁles, overall image quality is solid, with good dynamic range, punchy colours and of course noise levels up to ISO 1600 very well contained. Furthermore, with 15 million pixels to play with you can happily print up to A3 and beyond, plus you've really got the upper hand when it comes to creative cropping. So far so good, but how does the poor 50D's processor cope with these bumper ﬁle sizes? Very well indeed. Thanks to the brand-new DIGIC 4 Image Processor, you can still blast off a staggering 60 consecutive JPEGS or 16 RAW ﬁles at 6.3fps in a single burst. What's more, the camera is ready to start shooting again within seconds. The other major change is the new 3-inch LCD, which now has 920,000 pixels instead of 230,000 and features a new anti-reﬂective coating. Image previews are fantastically clear, crisp and detailed and you can now conﬁdently assess sharpness by zooming in to 100 per cent. The anti-reﬂective coating is also extremely effective, making the monitor a pleasure to use both indoors and out. You can even use the LCD to set your exposures via the all-new Quick Control Screen. This might seem counter intuitive if you're used to using the controls on the body, but it could prove handy at night when you can't ﬁnd your way round the camera, or if you're using a tripod and the controls are too awkward to reach comfortably. Despite having 'smudge-resistant protection' the LCD is highly susceptible to ﬁngerprints which drastically reduce visibility. The monitor also saps battery power and you'll need at least one backup battery on any day-long shoots. A back-up battery is also essential if you plan to use the Live View LCD function. Now in its second generation, Live View mode offers two new AF options – Live Mode and Live Face Detection mode. They take a few seconds to lock on, but add to an already compelling list of Live View functions including depth of ﬁeld preview, histogram and gridline overlays. 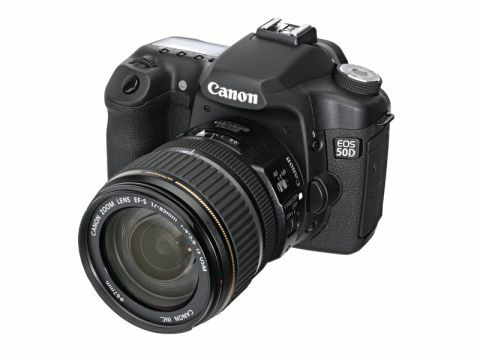 Other new 50D tools include HDTV connectivity and automatic vignetting correction. Of course the 50D has inherited all the 40D's best bits too, including the superb Highlight Tone Priority, which effectively extends the range of highlight detail captured in bright areas; the self-cleaning sensor and high-speed 9-point autofocus. When you ﬁrst start using the 50D, the sheer enormity of functions and gadgets on offer can be rather overwhelming. This can be potentially distracting from the business of taking great pictures, but over time and with the manual as your constant companion, you soon ﬁgure out what's useful and what can be ignored. All in all, the 50D is an extremely capable camera and though it's unlikely to sway existing Nikon users, would make the perfect upgrade choice for 20D and 30D owners or an affordable back-up for Canon pros.